Many graduates of LI political training have asked if the Institute provides follow up to the sessions on strategy and messaging. To provide for a way to continue your education in this important area, LI will provide a new feature and service --- an occasional commentary called "Sutton's Place," written by LI's Vice President of Development Steven Sutton, on current campaign messaging and strategy. It should come as no surprise to anyone exactly what the left will be doing this year, both politically and legislatively (which is the same thing to the left …remember, as far as the left is concerned, governing is simply politics by other means). The left understands that to have an impact on a large enough scale to matter, they need to announce their strategies far and wide. So if you keep your eyes and ears open (or continue to read these commentaries) you will know exactly what they are doing, when they are doing it, and why they are doing it. With that as the backdrop for the president’s actions this year, what do you think the chances are for the Keystone Pipeline, for example, to be approved this year? The merits of the project are irrelevant. There is simply zero chance that the president will risk upsetting his base by approving Keystone this year. Doing what is best for the country, economy, and for energy independence (especially if it goes against a core constituency in your political base) requires leadership. Yet for a president who always puts politics ahead of policy, this decision is a no-brainer. This president puts his political party’s interests ahead of America’s interests time and time again. That is why you have seen (and will continue to see) votes in the Senate on the minimum wage, pay parity, “income inequality” and other issues designed exclusively and cynically to promote a political message. 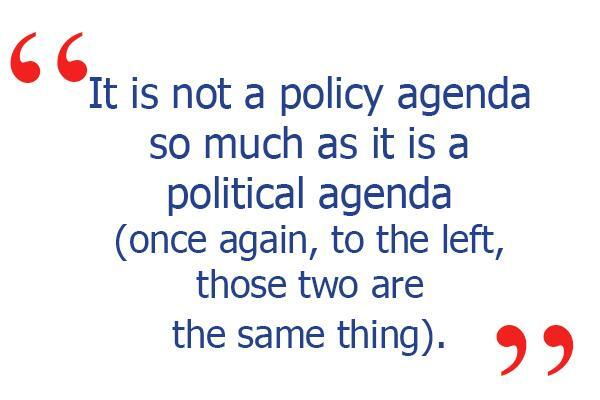 It is not a policy agenda so much as it is a political agenda (once again, to the left, those two are the same thing). Right on message (and repeated by a willing mainstream media reporter on page three of the Washington Post…gotta make sure everyone in the left’s coalition knows what the message is, after all). If you want to stay most up-to-date on the left’s 2014 messaging and political agenda, you may want to simply go to Congressman Steve Israel’s website (or that of the DCCC). You can be sure that their message, and the issues they will use to advance that message, will be prominently displayed there. Prior to joining the Leadership Institute, Steven Sutton was a chief of staff in the House of Representatives for more than 14 years, where he specialized in setting up Congressional offices for four different incoming freshmen Members. He has also managed numerous political campaigns from city council to U.S. Congress, specializing in challenger campaigns. As a graduate of the United States Naval Academy, Steve has a Bachelor of Science degree in mechanical engineering with many interesting stories to boot!